The jasmine flower is a shrub with abundant clusters of small, white, star-shaped petals. These flowers are native to Iran, India, and China. The jasmine flower has a mesmerizing, long-lasting fragrance with soothing effects. The name Jasmine is derived from the Persian word ‘yasmin’. Jasmine oil also has a reputation for being a powerful aphrodisiac. Is Jasmine Oil Good for Your Hair? Jasmine oil is obtained from jasmine flowers via a method known as enfleurage. This is one of the oldest methods of fragrance extraction. It’s an inefficient and costly process. In recent times, different methods have been used to produce the delicate oil including subcritical fluid extraction and CO2 supercritical extraction. As a result, Jasmine oil can be a costly oil and is usually available in an adulterated form known as jasmine absolute. This, however, doesn’t affect its abilities. Though one of the less popular oils for hair, jasmine oil has some great properties and benefits for the hair especially the scalp. In Pakistan, jasmine is their national flower while in India, the jasmine flower is regarded as a holy flower by the Hindus. 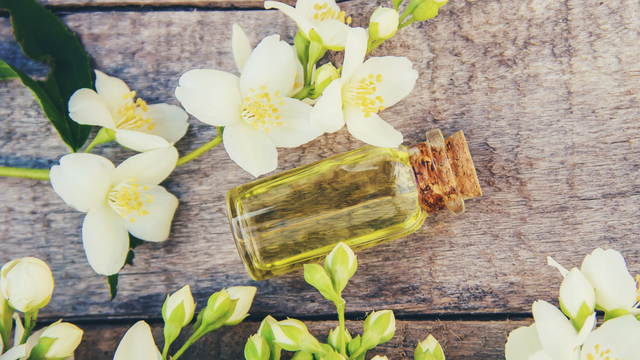 Jasmine oil contains benzaldehyde, benzoic acid, and benzyl benzoate, agents with antiseptic properties that can help address scalp problems like eczema, dryness, dandruff, and itchiness. Jasmine oil acts as an emollient. When applied on hair, it provides a protective coating, which locks in moisture, makes the hair shiny and tames frizz. Great option for use in the LCO/LOC method. When I wear my hair in a high bun as a protective style, I smooth jasmine oil quickly through my hair before pulling it up into a bun. The shine is gorgeous and of course, my hair smells like an awesome pacific island day. Adding jasmine oil to your deep conditioner followed by a session under the hair steamer can provide a very relaxing effect on the senses and help reduce stress levels. 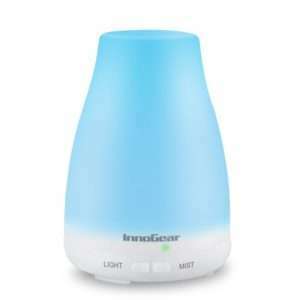 You can also get this effect by using a diffuser to spread the aroma around your home. Add coconut oil half way up the squeeze cap bottle. Add the Calendula oil the rest of the way. Add the jasmine oil. Close and shake. Apply the massage oil to your scalp in sections, massage and leave on overnight then shampoo and deep condition the next morning. Add 5 drops of jasmine oil to the deep conditioner as well. You can also choose to massage into your scalp every few days and wash out on your next full regimen day. Pour the coconut oil or babassu oil half way up the bottle. Pour equal parts of the grapeseed oil and macadamia nut oil the rest of the way up. Add the jasmine oil and vitamin E oil. This styling oil is excellent for finishing off a style. You can apply a few drops to your hair before roller setting, doing a roller set or curlformers set or to add some shine before throwing your hair up in a bun. Additional complimentary oils for jasmine oil include sweet almond and jojoba oil. Jasmine oil isn’t a suitable oil to address hair growth. 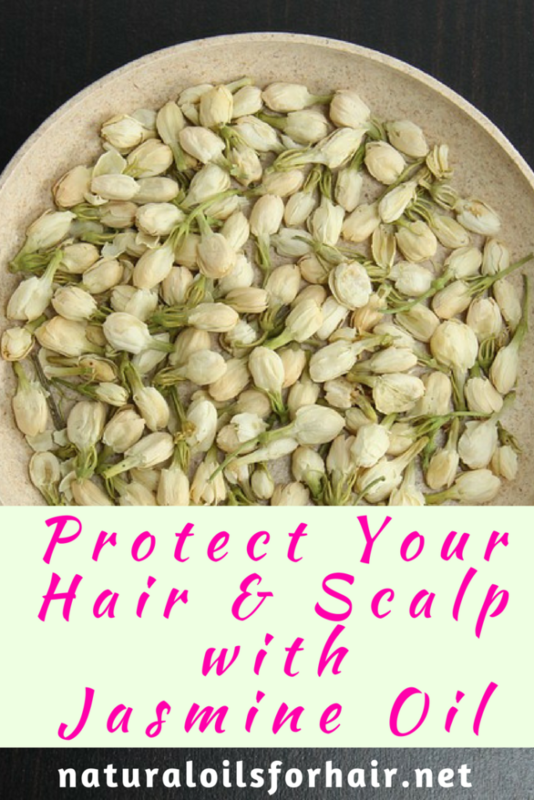 It functions well as a sealing oil for taming frizz as well as relieving annoying scalp issues but its strength isn’t helping with hair growth. For natural oils specifically targeted to hair growth, have a look at the hair loss archives. Though it has potent anti-fungal and antibacterial properties, jasmine oil should be used in moderation as applying too much can lead to oily hair and scalp irritation. The smell can also be a tad overpowering as I learned the first time I tried it. A few drops are all you need to get results. Where to Buy Pure Jasmine Oil?